Inside the lid, you'll find an integrated odour filter compartment that holds replaceable filters. The company also supplies you with removable inner buckets. These buckets incorporate liner-retaining holes and bag hooks that will help you prevent messy bag overhang. The lid scratches a little too easily. Joseph Joseph Intelligent Waste Totem features easily the most well-thought-out design. It is compact in size but big in features. 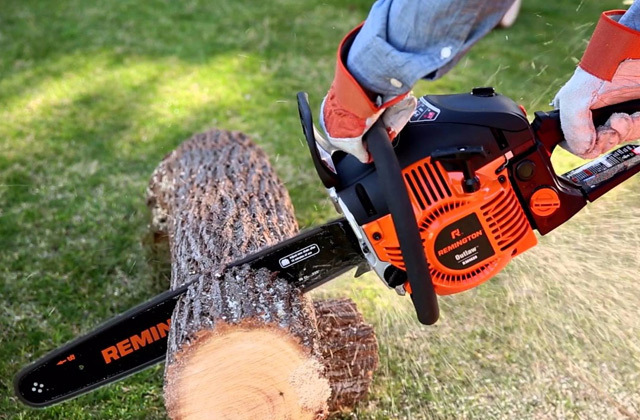 The unit is stylish and durable. 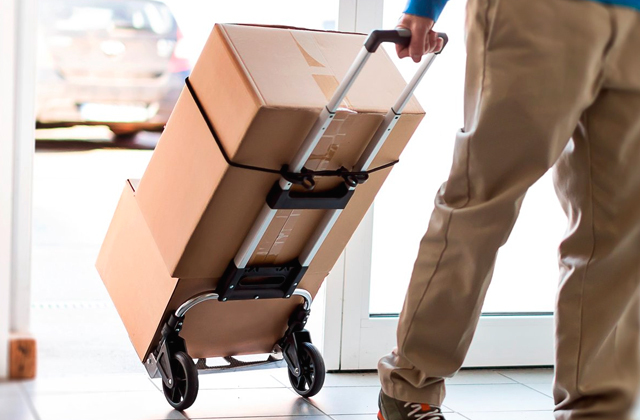 Most importantly, it makes recycling easy and effortless. 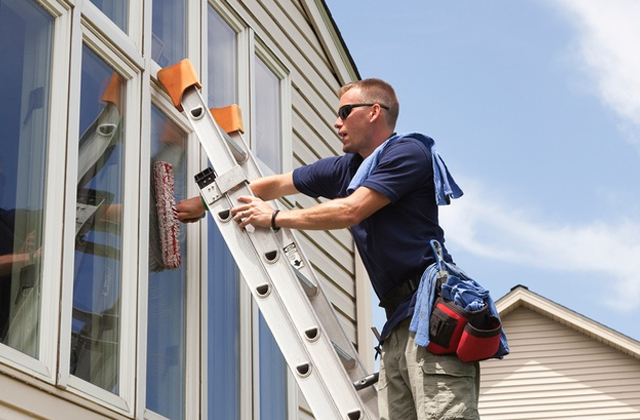 The stainless steel exterior is built to last, virtually immune to rust and corrosion. Both compartments have their own lid. You can independently open each lid using their own foot pedals. 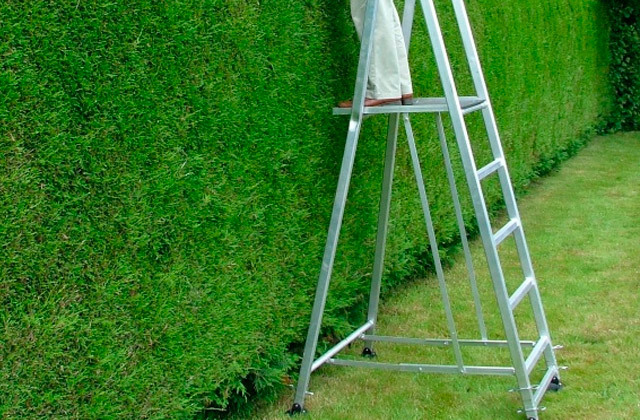 You won't have to reach down. With minimal physical contact, the hygienic benefits are obvious. The pedals are relatively flimsy. 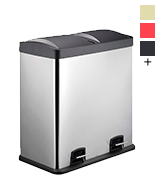 Harima 2 x 30 L Dual Recycling Bin will allow you to lead a much more environmentally-friendly lifestyle without putting in any extra effort. 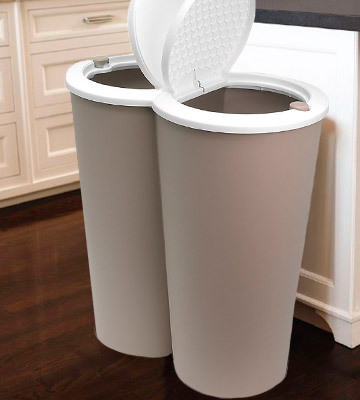 Worst-case scenario, this kitchen recycling bin will seamlessly blend with your kitchen décor. With its satin finish, the model should be able to seamlessly fit with any modern decor. Every compartment comes equipped with a removable inner bucket with handles, meaning that emptying the containers won't be all that difficult. The lids don't fit that tightly, so you might be able to smell the trash a little bit. 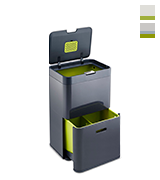 This bin from VonHaus is a versatile and efficient recycling solution. You can put it indoors and outdoors. The model will fit most homes as well as commercial establishments and public areas. With it, you'll be able to separate all rubbish and recycling bits. The compartments come fitted with tight, odour-proof lids that always keep the smell inside. There are no dividers or inner bins here, meaning that the model allows for easy cleaning and simplified maintenance. It can be difficult to find fitting trash bags. What we have here isn't the best product on this list. But if you take the ridiculously affordable price into account, this is easily one of the more cost-effective/efficient options here. You'll be hard-pressed to find a better deal for conscientious households on a budget. The product's non-toxic, recyclable polypropylene allows you to use the bins for toy storage or as dog food holders. The openings here are just right, able to keep the food nice and fresh. The bins are dishwasher safe. They come equipped with colour-coded markings. The white lids are easily soiled. There's a lot you can do with these recycling bins other than sort and separate trash. 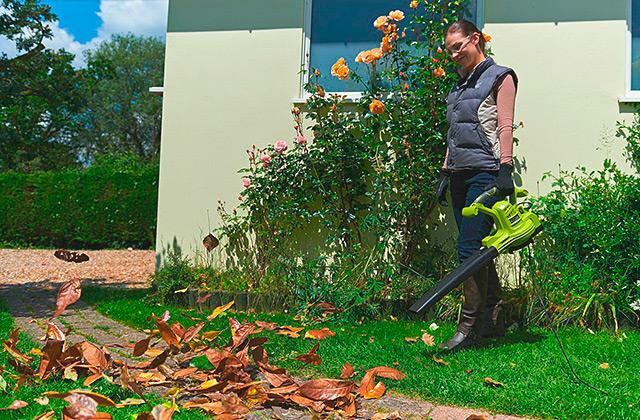 But, first and foremost, they will prove invaluable for people with limited available space looking to reduce their environmental footprint at home. Joseph Joseph Intelligent Waste Totem is a great product that really has a lot going for it and we aren't just talking about the hilarious but accurate "intelligent waste totem" part of the name. 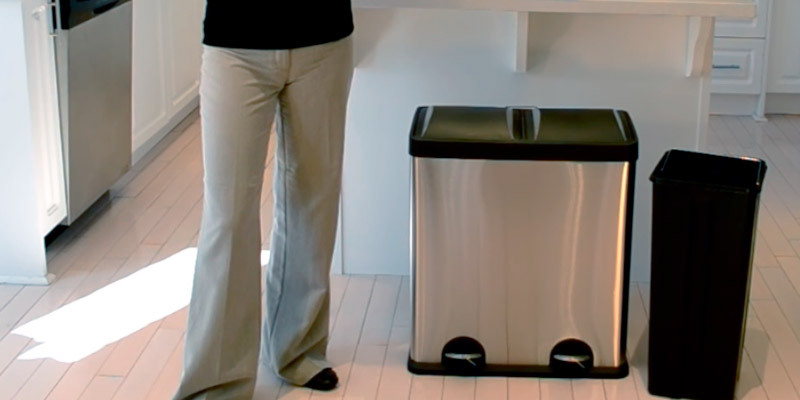 As far as we're concerned, this is probably the most well-designed household recycling bin on the market today. The whole thing measures 40 x 30 x 66 centimetres in overall dimensions, so it doesn't take up all that much space. The model is available in 2 finishes: stone and granite, both of which look fantastic. Its powder-coated stainless steel body and fingerprint-proof stainless-steel lid are as durable and robust as these things come (though the lid scratches a little too easily for our taste). 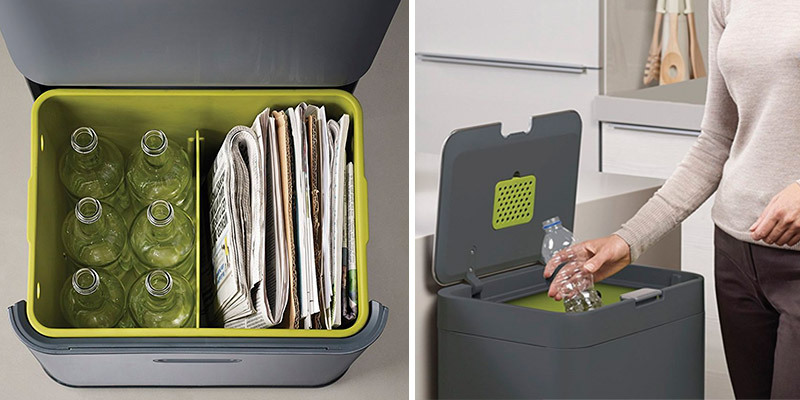 You have the general waste compartment that's great for everyday waste and recycling. 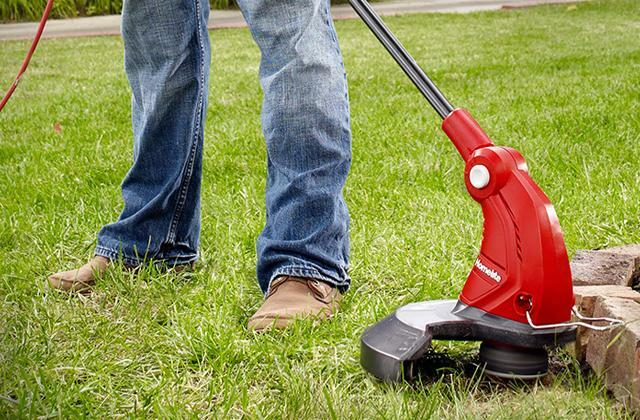 Equipped with breather holes in the base, the compartment makes it easy to remover the liner. The multi-purpose drawer comes with a removable divider so that you're able to separate waste. Furthermore, there are hooks that let you fix 2 standard carrier bags inside the drawer. Inside the lid, you'll find an integrated odour filter compartment that holds replaceable filters. In addition to the unit itself, the company supplies you with removable inner buckets. These buckets incorporate liner-retaining holes and bag hooks that will help you prevent messy bag overhang. Again, Joseph Joseph Intelligent Waste Totem features easily the most well-thought-out design. This organiser is compact in size but big in features. 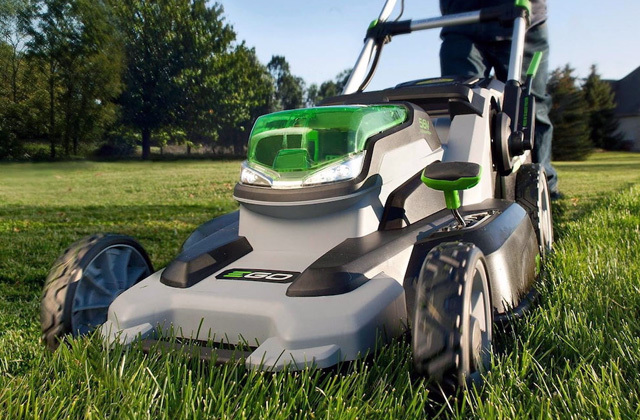 The unit is stylish and durable. 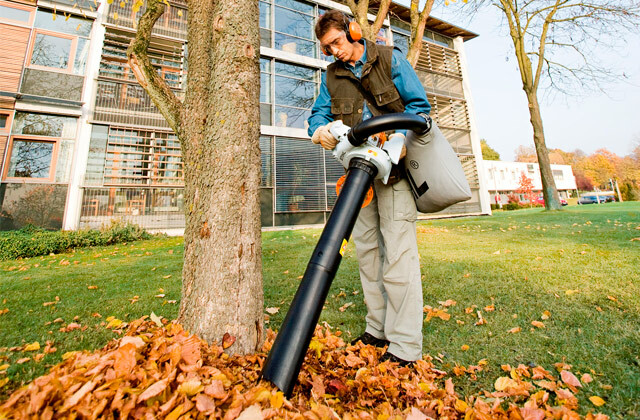 Most importantly, it makes recycling easy and effortless. All in all, probably the best recycling bin we've been able to find. There are many things preventing most people from recycling. First and foremost, it is a hassle. The idea and the process are hardly glamorous too. Harima 2 x 30 L Dual Recycling Bin doesn't necessarily change the whole paradigm but it does make recycling a lot easier and less off-putting. With its modern, sleek, and stylish form factor, the model will be able to fit practically any kitchen interior without appearing unsightly. Plus, it is available in a wide range of colours, so you'll definitely be able to match your kitchen setting. The stainless steel exterior is built to last, virtually immune to rust and corrosion. The lid, on the other hand, is made of premium plastics that do not break all that easily. Of course, none of these things are as important as this double recycling bin's functionality. 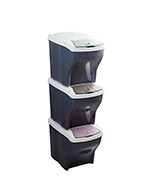 Featuring 2 internal compartments, the model allows you to separate your waste. 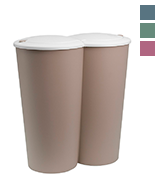 For example, you can use one bin for compostable wastes and the other for non-biodegradable ones. Both compartments have their own lid. 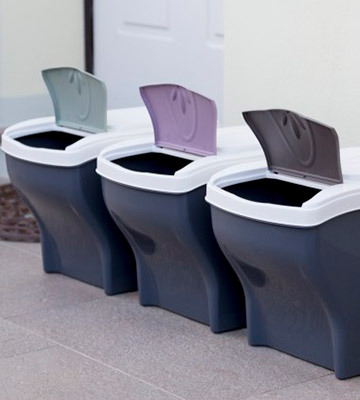 Furthermore, you can independently open each lid using their own foot pedals. You won't have to reach down. With minimal physical contact, the hygienic benefits are obvious. 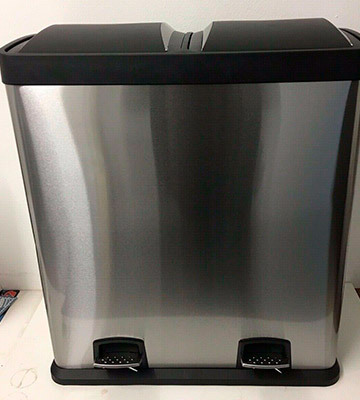 In other words, Harima 2 x 30 L Dual Recycling Bin will allow you to lead a much more environmentally-friendly lifestyle without putting in any extra effort. 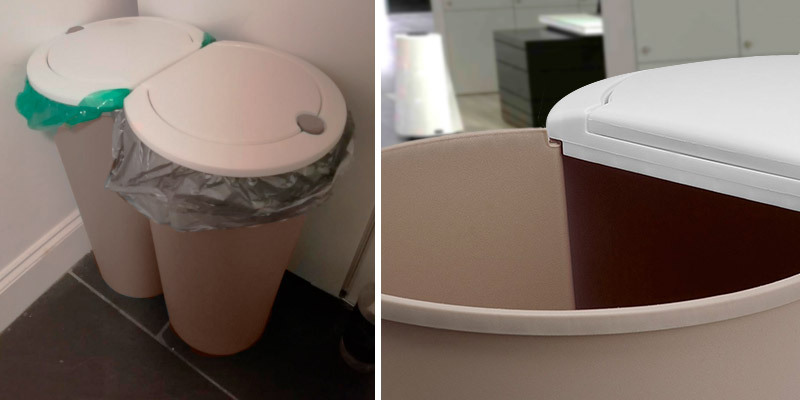 Worst-case scenario, this kitchen recycling bin will seamlessly blend with your kitchen décor. 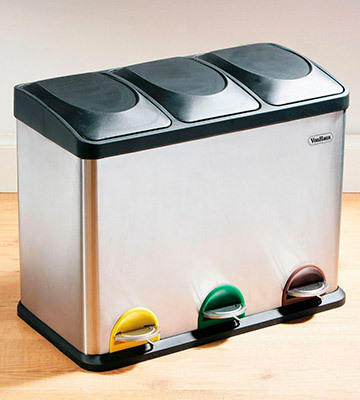 There's a lot to like about this recycling unit from VonHaus. First of all, the price is more than fair, especially considering that this sorting bin features 3 separate compartments. Furthermore, the compartments are colour-coded, making the model great for larger families with kids or even commercial establishments. 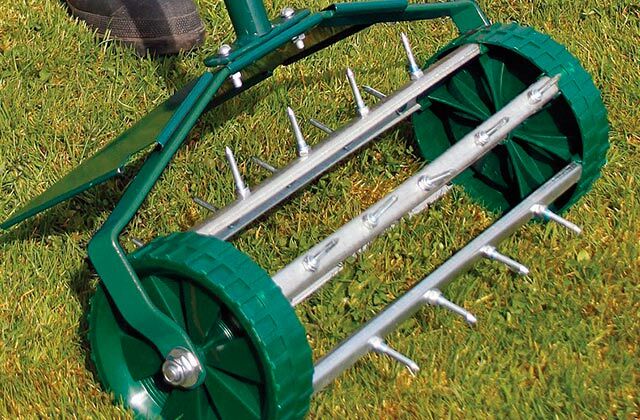 Its stainless steel construction makes the whole thing really robust and durable. Furthermore, with satin finish, it should be able to seamlessly fit with any modern decor. 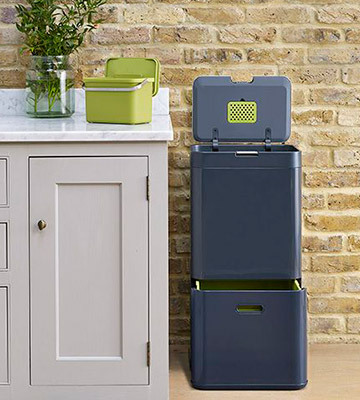 As you'd imagine, with 3 compartments, the model allows you to separate and recycle many different items like your general household waste, garden waste, compost, glass bottles, aluminium cans, paper, plastic, the list goes on. There really isn't a whole lot to complain about here. Our only niggle is that the lids don't fit that tightly, so you might be able to smell the trash a little bit. Other than that, each compartment has its own foot pedal, so you won't have to bend your beck every time you'd like to drop some trash into the bin. On top of that, every compartment comes equipped with a removable inner bucket with handles, meaning that emptying the containers won't be all that difficult. 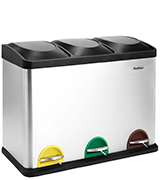 Bottom line, this bin from VonHaus is a versatile and efficient recycling solution. 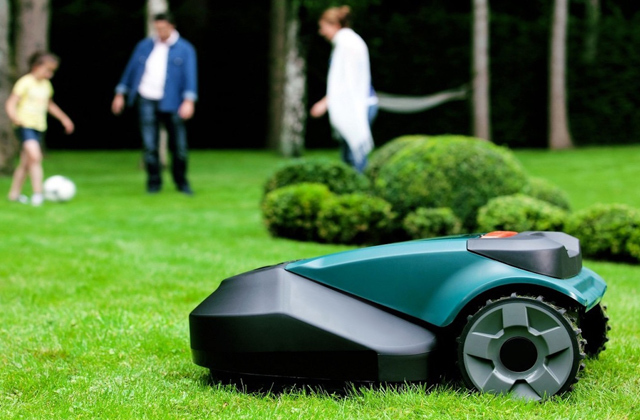 You can put it indoors and outdoors. The model will fit most homes as well as commercial establishments and public areas. 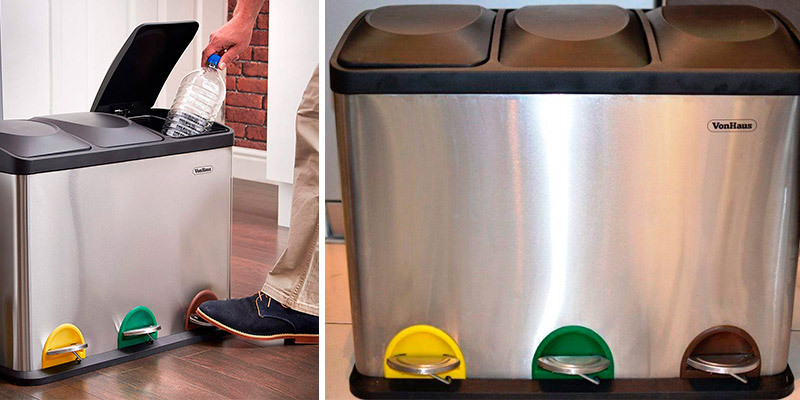 With it, you'll be able to separate all rubbish and recycling bits. On one hand, this double recycling bin is a little more basic than the previous models. As you can probably infer from the pictures, the containers don't have a stylish stainless steel construction with a sleek finish and/or a streamlined profile. 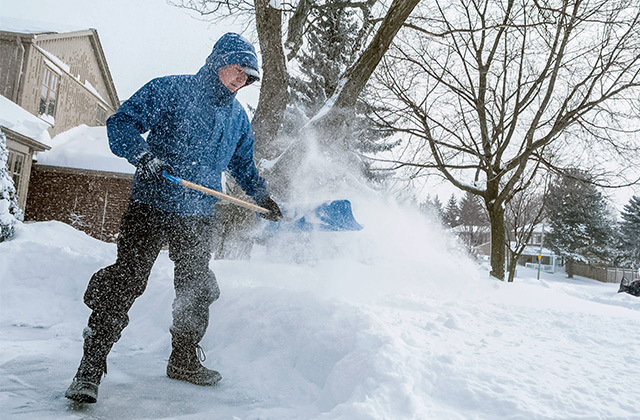 Furthermore, because of the relatively irregular size, measuring 50 x 30 x 53 centimetres in overall dimensions, it can be difficult to find fitting trash bags. That being said, it's not like this product has nothing but downsides compared to every other product on this list. It is available in black, silver (more grey than silver), blue, green, brown, and pink, so you'll be able to choose the colour that better fits the intended room. With two 25-litre compartments, the model will be able to hold a lot of rubbish at a time. The compartments come fitted with tight, odour-proof lids that always keep the smell inside. Equipped with push-button opening mechanisms, these lids are secure but also hygienic enough and easy to handle. 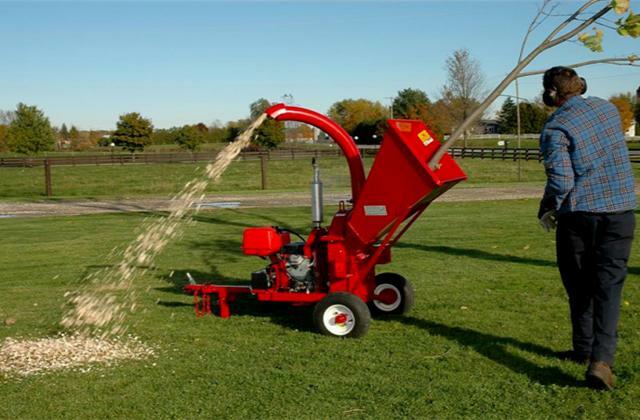 There are no dividers or inner bins here, meaning that the product allows for easy cleaning and simplified maintenance. All in all, what we have here isn't the greatest product on this list. But if you take the ridiculously affordable price into account, this is easily one of the more cost-effective/efficient options here. You'll be hard-pressed to find a better deal for conscientious households on a budget. This stacking Bama Poker Tris 3 Set will prove invaluable for people with limited available space looking to reduce their environmental footprint at home. Each bin adds up to 28 x 40 x 31 centimetres in overall dimensions. You can put them side-by-side or on top of each other. Needless to say, the latter way will allow you to save a lot of space. With their stack-together construction, you'll be able to access the bins regardless of how you put them. The product's non-toxic, recyclable polypropylene, on one hand, allows it to blend well enough with most kitchens. 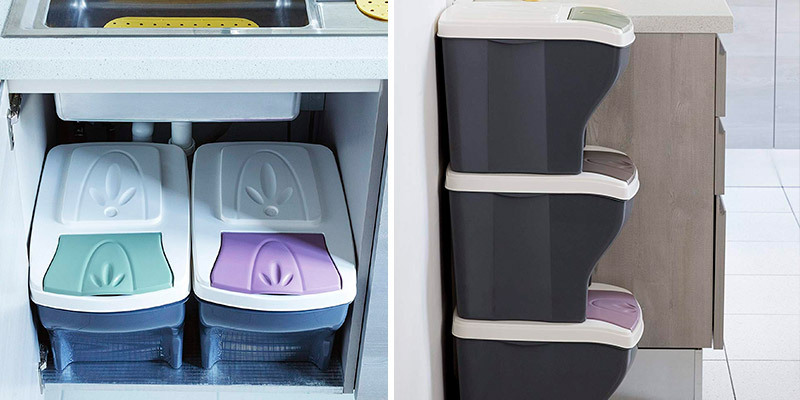 You can use these little bins for storage purposes. Heck, you can even use the containers as dog food holders. The openings are just right, keeping the food nice and fresh. On the other hand, these things aren't even remotely as durable as their stainless steel counterparts (though they are a lot less heavy) and their white lids are easily soiled. However, the bins are dishwasher safe, so they shouldn't prove too demanding in terms of maintenance. We really like the colour-coded markings. With these markings, you'll be able to teach your kids recycling without having to clean and move the trash after them. To sum it up, there's a lot you can do with these recycling bins. We wouldn't put them outside but, again, these things are great for smaller kitchens with limited available space. What Is a Kitchen Recycling Bin? "What is a kitchen bin" sounds like a bit of a silly question, doesn't it? You add to that the recycling part and it is still easy to figure out. Nevertheless, you'd be surprised how much goes into constructing the right bin. First of all, the manufacturers of these containers try to take into account the way it'd interact with the owner and the trash can liner. In order to do to that, the people behind these products implement things like liner pockets and liner rims. Other than that, a good kitchen recycling bin should include some sort of a "silent lid" solution that would allow the user to easily open and close that lid without having to deal with loud noises every single time. Naturally, the "recycling" part demands certain changes too, like different compartments for different types of trash. After all, no matter how you slice it, recycling is worth it. The capacity of the bin and the size of the whole thing go without saying. But you might also want to take into consideration the material as it is the driving force behind the product's durability and visual appeal (or lack thereof). And if you're the kind of person who prefers a more modern touch, there are certain kitchen recycling bins out there that even include such high-tech solutions like motion sensors and natural carbon deodorisers. While we're on the subject of kitchen-related containers, you could also take a look at our reviews of bread boxes and cooler bags.